Cats are without a doubt one of the coolest and relaxed pets to have. So waste management is about the only unpleasant part of cat ownership. A good and appropriate cat litter box can make this unpleasant job a lot easier. This article will help you find a cat litter box that fits your cat’s needs. How Often Should I Clean The Cat Litter Box? It’s Time To Clean The Cat Litter Box, Yuck! Every house or appartment has corner space that is sometimes difficult to fill up. 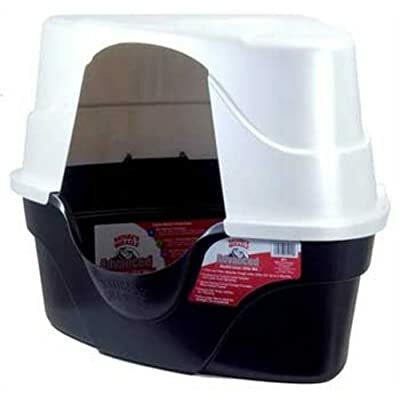 If you’re looking for a great litter box and already know of a corner where you can put it, getting this hooded corner box is definitely to consider. This boxes comes with oder blocking techonlogy and is big enough for larger cats (21 x 24 x 21 inches). If you have enough space for it, these great features will make you choose this box instead of the more basic or smaller litter boxes. Have a look around in the house and take some measurements to see if it would fit before actually making the purchase. Although this handy jumbo size litter box is with its 22 x 17 x 18.3 inches smaller than the boxes above, it’s still making the top 3, mainly because of its carbon filter that keeps odors inside the litter pan. Replacement carbon filters are being sold separately. 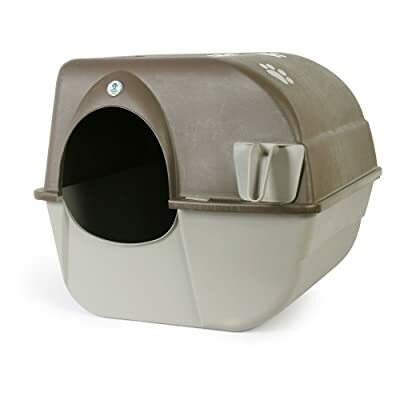 This second best hooded litter box is a bit more expensive than the Petco Jumbo Enclosed Litter Box. The difference between the two is that you can close the door of the Catit while the Petco has an open door. 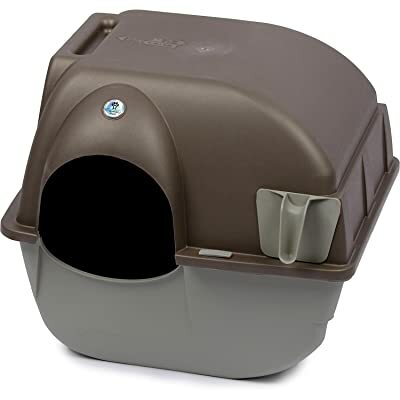 The CleverCat Top Entry Litter Box is probably one of the most-well known cat litter box brands. Although you might not like how it looks, it’s highly effective in keeping dogs out of the box. The practical design also reduces odor. Using CleverCat custom heavy-duty liners allows for quick, easy and sanitary litter box changes. The only disadvantage is the price, which is almost twice the price of the other top rated litter boxes. However, it’s well-worth the investment when you also own dogs. The Litter Robot is the automatic, self cleaning litter box for cats “that really works”. When your cat enters the litter chamber (globe) a weight activated sensor detects the presence of your cat. After 7 minutes a clean cycle starts with the slow rotation of the globe in a counter-clockwise direction. The rotation of the globe sifts and separates clumps from the clean litter (clumping litter) and deposits all waste in the large capacity drawer lined with a standard kitchen garbage bag. The globe then returns to its home position with a clean, level bed of litter ready for the next use. The Litter Robot has no rakes or wires to jam, clog or break. Its simplicity and durable construction ensure a long life of service. The Litter Robot operates on 12VDC and is easy to set up – just add litter to the globe and plug it in. The Booda Clean Step Litter Box closes the top 4 list because it’s 99% odor free and stylish at the same time. This litter box doesn’t only look a bit special, it also includes all the features of a great litter box. With its 22 x 22 x 21 inches it can accomodate cats of just about every size. This box also includes 1 Booda Clean Step Charcoal Filter and 1 Booda Clean Step Liner. One of the cons seems to be the fact that while the steps should help tracking, some customers report that it’s not the case. The best solution would be to purchase a litter trapping mat. The CatGenie Self Washing Self Flushing Cat Box is the world’s only self-flushing, self-washing cat box. You’ll never touch, change or buy cat litter again. The CatGenie Self Washing Self Flushing Cat Box works with granules instead of litter. Collecting cat waste in a box of litter is unsanitary. Cleaning the mess out is unpleasant and carrying heavy cat litter in and of the home is just a plain waste. The CatGenie is dust, germ, odor and litter free and automatically washes, sanitizes and dries itself. The CatGenie has a Two-Year Warranty. If you have a rigid water line in your bathroom, you may need to replace it with a flexible one) or utility/laundry room. When you purchase the CatGenie, everything needed to make your home litter free is included: The only tools needed are a wrench or a pair of pliers. Some non-standard hook-ups may require additional parts not provided by PetNovations, Inc. Included supplies should last over 3 months for 1 cat and about 2 months for 2 cats. The CatGenie Self Washing Self Flushing Cat Box is the greenest cat litter box ever and quite possibly, the most economical. The plastic in the SaniSolution Cartridge is biodegradable and does not need sun just bacteria or you can take the plastic case and recycle it (unlike cat litter which is neither biodegradable or recyclable). Each cartridge holds 120 washes and when set on Cat Activation provides 240 washes (a year supply of Cartridges takes up less space and uses less plastic than 1 container/1 month’s supply of cat litter). Why you’d buy it: the CatGenie Self Washing Self Flushing Cat Box is truly unique in its kind. Not only is the manufacturer proud to present this unique product, NetSolutions also provides an excellent customer service. Why you wouldn’t: if your cat’s poo is not firm, it can get broken into smaller pieces that get missed by the scoop, and when heat dried, can stink up the place. You can solve this problem by feeding your cats dry food which will help to get their poo firm enough. In addition, people report a long cleaning cycle (between 30 and 45 minutes). The CatGenie Self Washing Self Flushing Cat Box is also pretty expensive. You’ll also need to install a new SaniSolution cartridge every 3 months on average and get Washable Granules. Omega Litter Boxes are like the Rolls Royce’s of the manual self-cleaning litter boxes. 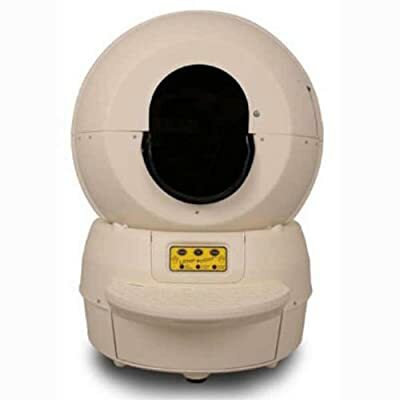 If you have been thinking about getting a self-cleaning litter box, don’t want to deal with the automatic and electric expensive models, then the Omega Paw Self-Cleaning Litter Box, Large, could be your solution. The Roll Away Self Cleaning Litter Box cleans in just seconds without scooping. Inside the litter box there is a unique patented grill that separates out the clumped waste, depositing it into the pullout tray. 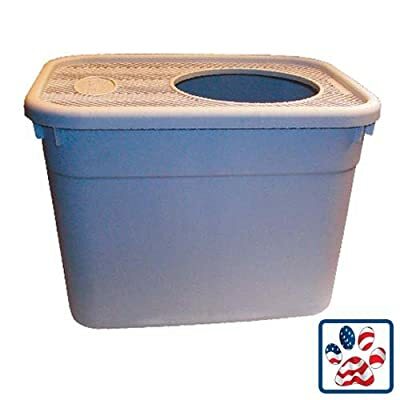 This Large Omega Litter Box is great for big cats or for multiple cat households. Why you’d buy it: this Omega Litter Box is cheaper and higher rated than the Omega Paw Self-Cleaning Litter Box, Pewter and probably the best alternative for automatic self-cleaning litter boxes. If you have a big cat or multiple cats you might prefer this large model. Why you wouldn’t: this Omega Litter Box also seems to show a few imperfections when it comes to the design. However, most cat owners don’t really seem to be bothered by them as long as the helps them to do the job quickly and easily. And as you could see in the video above, it is a pretty neat product. The ScoopFree Self-Cleaning Litter Box is the self-cleaning litter box that you can leave alone for weeks at a time. It’s the only self-cleaning litter box that uses disposable litter trays to provide hands-off convenience and unbeatable odor control. You don’t have to see, touch, or smell messy waste. Simply load ScoopFree with the disposable litter tray pre-filled with Premium Blue Crystals. When your cat uses the litter box, the crystals immediately absorb moisture and odor and begin to dehydrate solids. Twenty minutes later, ScoopFree’s rake automatically sweeps the waste into a covered compartment, leaving the litter smelling clean and fresh. Simply replace the disposable tray every few weeks and the litter box is just like new. 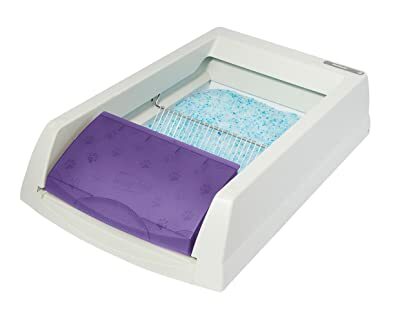 Most people use The Forever Litter Tray, which is a hard plastic tray, with this self-cleaning litter box so that they don’t need to buy disposable trays. The ScoopFree Self-Cleaning Litter Box is so reliable it comes with a 90-day money back guarantee. Why you’d buy it: people love the ScoopFree Self-Cleaning Litter Box because its ability to moisture and odor. With this litter box you will never ever smell anything bad again. Why you wouldn’t buy it: although the litter box itself isn’t very expensive, you will need to buy The Forever Litter Tray or ScoopFree Litter Refills. Although the manufacturer claims that you don’t need to touch, clean or fill the litter box for up to 30 days, some people report that the cartridge doesn’t last for 30 days. Omega Paw’s Roll’n Clean, Self-Cleaning Litter Box is just what you are looking for! The Roll’n Clean litter box doesn’t use electricity and never breaks down. It just keeps rolling and rolling. 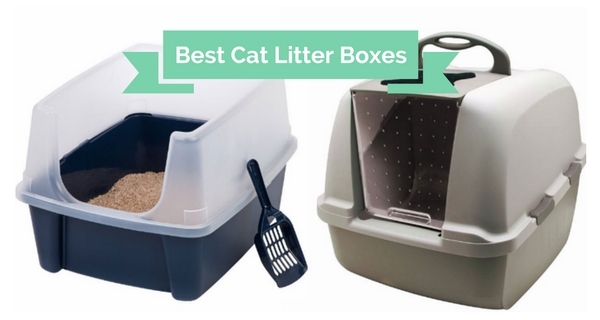 Save yourself the headaches and money by buying this amazing self-cleaning litter box. Ideal for big cats or multiple-cat households, this large Roll’n Clean, Self-Cleaning Litter Box quickly self-cleans, while controlling dust and containing odors. The Omega Paw Self-Cleaning Litter Box, Pewter, allows you to clean your cat’s waste in just seconds, without scooping! This litter box also requires less litter than a traditional box and the scoop only collects clumped waste. Clean litter is never thrown away. 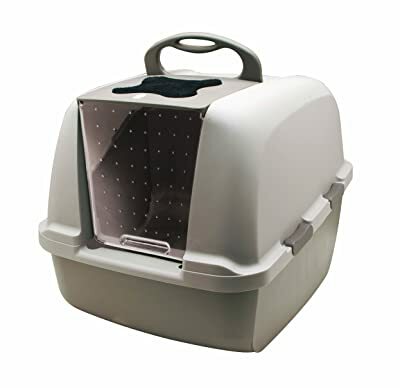 The Omega Paw Self-Cleaning Litter Box, Pewter, works best with clumping and silica litters. Simply roll the litter box to the right until the top touches the floor then roll it back to the upright position. Inside, a unique patented screen separates the clean litter from the clumped waste putting all the waste into the scoop. Pull out the scoop and dispose the waste. It’s that easy! Why you’d buy it: an Omega Paw Self-Cleaning Litter Box is most probably the best alternative for automatic self-cleaning litter boxes. People who had many issues with automatic boxes usually find this cat litter box the best litter box they have ever had. 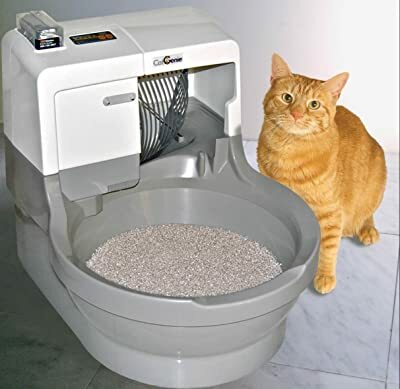 Why you wouldn’t: based on what some users say about the Omega Paw Self-Cleaning Litter Box, Pewter, the design itself seems to be a bit flawed. However, many other people don’t seem to be bothered by this and already found solutions to the problems. Get rid of the hassle of cleaning your pet’s litter box with the Pet Safe Simply Clean Litter Box. This is an innovative and self-cleaning system that works continuously and automatically. The Pet Safe Simply Clean Litter Box is suitable for cats weighing up to 15 pounds. It’s also quiet and simple to use. 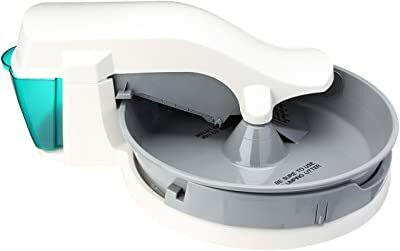 The bowl moves one complete rotation in an hour and also gets rid of foul odor and odor-causing bacteria. It does its bit without disturbing your pet; reducing odor and odor-causing bacteria. No special bags required; easy-to-use. The Pet Safe Simply Clean Litter Box continuously cleans without disturbing your cat. The bowl moves one complete rotation in an hour. The Pet Safe Simply Clean Litter Box uses a low-voltage AC adapter. The category is a key aspect when you’re looking for the best cat litter box for your cat(s). As you can see, I have selected the 15 best cat litter boxes on the market and ranked them by category. Depending on your cat’s needs, you will have to make a choice for the right type of box. Let’s have a look at the pros and cons of each type of cat litter box. A corner box can save you a lot of space. Well, it’s a corner box, so it fits best in corners only. 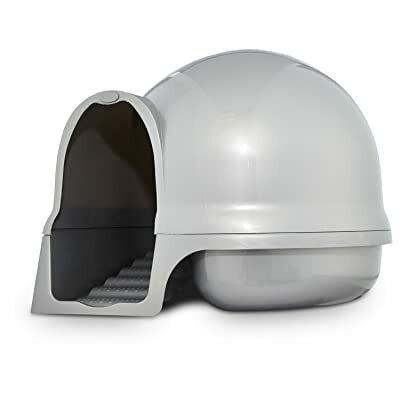 A hooded cat litter box is a great fit for cats that love digging. These boxes usually contain odors and keep the urine inside when your cat sprays. Big dogs can’t enter the box. Your cat might not appreciate the odors inside the box. It’s also harder to scoop and clean the box. A self-cleaning cat litter box makes waste disposal a lot easier. This box has the same disadvantages as the hooded box. Sifting boxes may also not work well with certain types of litter. They are usually also more expensive. Open top boxes are usually cheap and give the cat easy access. The bigger the box is, the easier it will be for your cat to do its business. If the box doesn’t have a high wall, your cat might scatter litter over the side. Kids or other pets can get into the litter. Dogs and kids usually can’t get into these types of boxes. A top entry box also keeps the litter and urine inside. Kittens usually can’t get into the box. Harder to scoop than an open-top cat litter box. Now that you have seen the options and reviewed our top picks for the best cat litter box on the market, it’s up to you to choose one for your cat(s). On this article I have presented you the best cat litter boxes currently available and I hope it helped you to find one that suits your cat’s needs. Finding the best place to put a cat litter box is not always easy; definitely not when you live in an apartment or small house. And when you’re a first time cat owner, it’s possible that you have no clue what the best places are. If you want your cat to find its way to the litter box quickly, you’ll have to take some things into consideration first. Next to the washing machine might not be the best place. If you have any cat experience, you’ll know that cats are pretty prone to noises. Loud or strange noises scare cats away and are to be avoided. You’ll notice it when your cat is afraid of something: it will crawl on the ground with its ears down and find a safe place to hide. So it’s best not to put the cat litter box next to loud appliances (like a noisy washing machine) or in noisy and unpredictable environments. When a cat doesn’t feel safe, there’s a high chance that it will avoid using the cat litter box and do its business somewhere else in the house. So you might want to consider a room where there’s enough privacy for your cat and at the same time more than 1 way to leave. Or if you put the litter box inside the bathroom, shower or other small places with only 1 entry, you’ll have to keep the door open. If your cats didn’t grow up together, using the same cat litter box might cause a problem. Some cats have absolutely no problem with sharing one box while other cats refuse to do it. So if you have tried different locations and still experience difficulties, you might consider getting a second cat litter box. When your living space is limited, finding the best place to put the cat litter box might be more difficult. Some manufacturers of litter boxes came up with the idea of designing the box as furniture. I call these litter boxes “modern cat litter boxes“. If you decide to go down that route, you’ll have to keep in mind that not all cats will easily adapt. Imagine what you would think if someone told you that a piece of furniture is now actually your bathroom? As far as I remember we always had the cat litter box inside the porch, next to the garden door. The great thing about this location is that when a cat has to do its business, it will ask to be let outside. When it’s winter for instance and freezing cold, it will find the box on the way out (while it actually doesn’t want to go out in this cold). When you’re still “potty training” a kitten, of course it probably won’t understand that it has to go outside to do its business. But from my experience once it knows that it’s not allowed to do it inside the house, it will recognize the cat litter box faster when it’s on the way to the garden. When your cat prefers other places throughout the house above its cat litter box, you definitely want to address this issue right away. I have enlisted some simple tips to help your cat stop peeing outside the cat litter box. There are 2 possible reasons for your cat’s misbehavior. When cats are marking their territory, they will be spraying inside the house. While in case of inappropriate urination the cat will be peeing outside the cat litter box and always leave a larger puddle behind. By understanding the problem, you’ll make it easier to find a good solution. I already mentioned several times before on bestcatlitterboxes.com that it’s important for your cat to feel safe. By addressing issues like inappropriate urination quickly, you will bring more structure into your cat’s life. The goal is of course to have it not happen again. So you have to make sure that this type of behavior doesn’t become a habit. Clean the places where your cat has been thoroughly? You don’t want the odor your cat left behind to attract it back to that same spot. And of course, I’m sure that you also don’t really like the smell. Normally one cat litter box will do. However, if your cat is able to access more than 1 floor of the house, you’ll probably need to have a litter box on each floor. By giving the cat easy access to its box, you will lower the chances of your cat peeing outside the cat litter box. Are you sure that your cat finds its way to the box easily? If it’s tucked away somewhere it’s possible that it doesn’t find the litter box. If your cat keeps urinating on the same spot in the house, you can try putting the litter box on that spot. Once the cat starts using the box, you could then slowly move it towards the location where you want it to be. In this article you can find more information on the best places to put your cat litter box. There’s always a chance that your cat simply doesn’t like the box. Maybe it differs too much from what it’s used too? You might consider trying a different cat litter box and see how the cat reacts. Also don’t forget to keep the cat’s age into consideration. Older cats won’t always appreciate boxes that are difficult to get into for instance. Dirty litter boxes put off cats and that’s one of the main reasons why cats start peeing outside the cat litter box. Imagine that you would have to go to an unflushed toilet. The same thing counts for cats. Learn more about how and how many times you should clean your litter box here in this post. Check the type of litter you are using. Cats don’t like litter that is heavily perfumed. Or maybe you have just changed the type of litter in the box and your cat disagrees with your new preference. Most cats seem to prefer loose, clumping and unscented litter. Maybe something has changed in your cat’s social situation, for instance the introduction of another cat or perhaps even the arrival of a dog at the neighbours. In that case it could be possible that your cat is associating using the litter box with some kind of a bad memory. If inappropriate urination has become an ongoing problem with your cat, you should definitely consult a veterinarian. The vet will examine your cat to see if there’s a medical problem. If the problem is not medical, you can then look into possible behavioral or environmental issues. Your veterinarian could possible also refer you to someone with more (professional) experience in that domain. So your new kitty has arrived and you have found the best place to put your cat litter box. Now you’ll have to do a dirty job every once in a while. The amount of time that you should clean the cat litter box logically depends on how often your cat uses it. The basic rule is that you scoop out your cat’s litter box every time your cat used it. Cats don’t use a dirty litter box. If you have a garden, you’ll also not see your cat doing its business on the same place twice. If your cat spends a lot of time outside, you might not need to clean the cat litter box for more than a week. Most cats stay inside during the night when winter arrives, so that’s when you will have to check up on the litter box more often. If you’re using a clumping litter and you scoop every day, a complete change of the litter once a month will do. However, there are many different types of litter, so the best advice here is to check how it smells. If you can’t smell anything, you usually don’t need to do a complete change of litter. Remember that cats have a stronger sense of smell than us. As long as your cat is not going outside the box, then what you have been doing must be working. If the box is being used daily, you’ll have empty the box and wash it with soap at least once a week. If you’re using a basic plastic litter box, you might consider replacing it like once a year or so. When you’re cat uses it a lot, it can leave scratches on it regularly, which attracts odor. It’s not nice to have a smelly box inside the house. In addition, your cat could also be put off by the smell. Whatever you do, don’t try to get rid off smells by placing a room deodorizer. Although you might think that it works for our bath rooms, cats’ noses are much more sensitive and that strong smell will not get appreciated. If you don’t like cleaning your cat’s litter box, then you can decide to get a self-cleaning litter box. 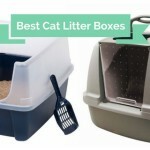 Although their designs or technology aren’t always perfect, these types of litter boxes can still make your life easier. There are quite cheap manual self-cleaning litter boxes and automatic litter boxes, which can be pretty expensive. Keep in mind that the automatic litter boxes could possible scare away your cat, so it’s important to do due diligence before buying one.